Despite the defeat of Team USA, American interest in World Cup soccer has never been higher. This week, four hotly contended quarterfinal matchups continue to feed America’s newfound lust for soccer action. Intertops Sportsbook has a wide range of betting options for the Netherlands vs Brazil, Uruguay vs Ghana, Argentina vs Germany and Paraguay vs Spain matches this weekend and a free contest will award one lucky person placing a World Cup bet a trip to the Super Bowl. 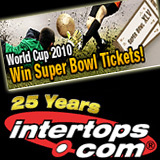 Odds for all semifinal matches will be posted at Intertops.com/Sportsbook after the Paraguay vs Spain game on Saturday. Betting propositions, including team to qualify, half-time score, winning margin and first/second half total goals, will be posted and updated daily. For the first time in World Cup history four teams from South America have reached the quarterfinal stage. The Intertops bookmakers see Brazil as favorites to win the final (+225), followed by European champion Spain (+250) and Diego Maradona’s Argentina (+400).